Many would agree that coffee truly is “the best part of waking up”. Earlier this month Folger’s announced their new Folgers Perfect Measures Coffee Tabs product. Each tablet is a compressed serving of one tablespoon of coffee, making it easier for consumers to brew their cup of joe with the correct amount of grounds to allow for consistent brewing from day to day. According to Kelton Global national survey, 74% of people say they need to start their day with a cup of coffee, but nearly 20% feel it’s difficult to accurately measure the right amount of coffee needed for brewing. While the packaging for this innovative new product isn’t any different than the packaging for regular coffee beans, it does point out that the coffee industry has increasingly been introducing more innovation and interest to the store shelves in recent years. For years the classic metal coffee can or vacuum-sealed bag were the only ways that you purchased coffee beans from the store. Now you can find coffee sold in a number of formats – from pre-brewed coffee in a single serve carton with a spout, to teabags, to easy-to-grip canisters, to the newly ubiquitous k-cup design. Starbucks VIA Instant Packets make brewing a single-cup on the go a piece of cake. Green Mountain Coffee led the way to the biggest and most popular change in the category with Keurig K-Cups. Dunkin’ Donuts Box O’ Joe is an easy way to bring hot coffee in bulk, no percolator or large dispenser needed. Coffee industry leaders Maxwell House and Folgers have both introduced easy-to-store square “canisters” with easy-to-hold large gripping areas. Due to the popularity of iced coffee, coffee can now be found in the refrigerated section of the grocery store as well in large cardboard cartons and single-serve drinkable Tetra Pak cartons. Large gusseted pouches, such as this stand-up pouch by Dunkin’ Donuts, provide consumers with bulk ground packaging options that will reduce in size as they use the product. Folgers introduced this sleek, easy-to-hold shaped canister for their instant coffee crystals to differentiate from their regular bean product. Another single-serve option for those who want to take the guesswork out of measuring out beans – Folgers coffee bags. While we’ve seen a few brands introduce flavor shots for coffee in this on-the-go squeezable container, Maxwell House has come out with an iced coffee concentrate the consumer can add to water or milk. In Korea you can find a brewed can of Maxwell House in a soda-pop style can. This article written by Steve Callahan, General Manager of Perimeter, was originally published in Flexible Packaging Magazine. Earlier this year, a new format called BlenderPak was launched. The format of the pouch is designed to increase new usage occasions away from home and invite more users to powder drink mix categories, such as protein powders, fruit drinks, nutraceuticals, meal replacement shakes or fiber supplements. 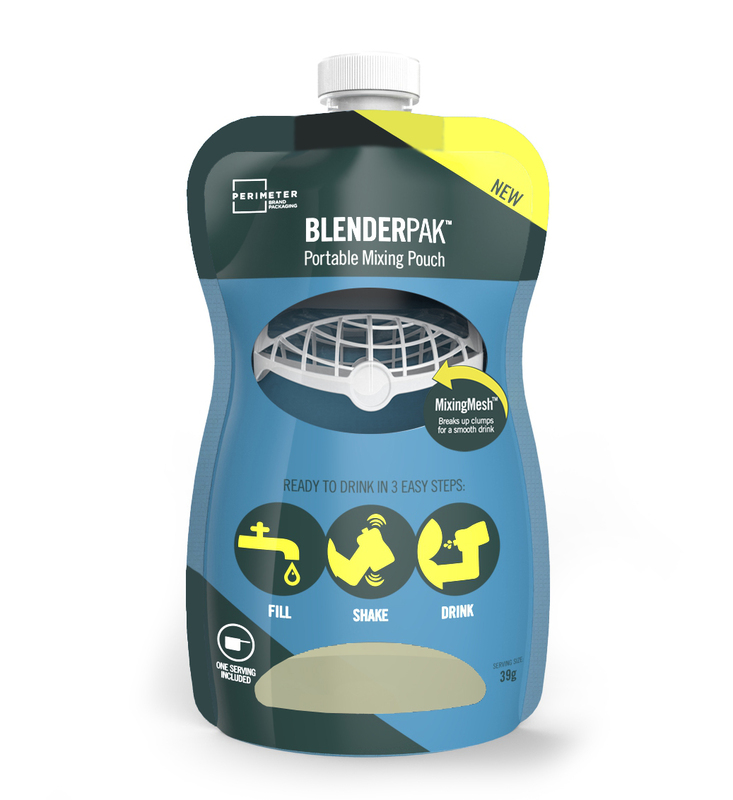 BlenderPak is a single-serve pouch with a rigid fitment inside that acts both as a gripping structure and mixing ball. The pouch is pre-filled with one serving of powder, so the consumer only needs to fill the pouch with water and shake. 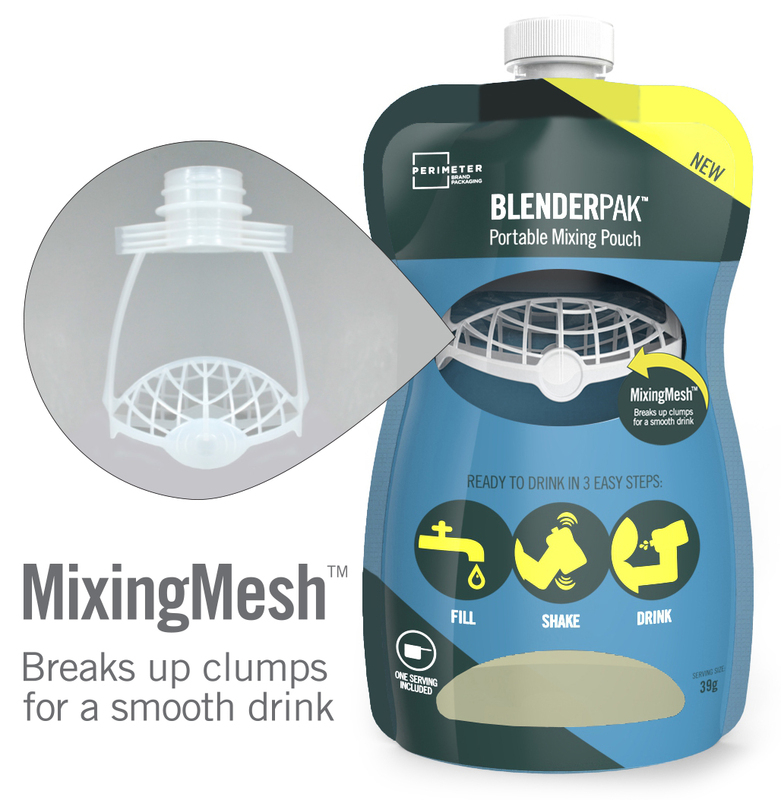 The patented MixingMesh technology helps break up the clumps of powder and deliver a smooth beverage. Throughout the development of BlenderPak, we worked with consumers who regularly use powder in the concept and final design verification phases. Sixty-six percent of consumers of powder mixes use it away from home at least four times a week. Their feedback was clear; this new format will help them take their powdered products on the go more easily and, because it is convenient, they would use it more often and in more places, thus increasing product consumption and sales. When it comes to powder drink mixes, one thing is clear – there’s nothing worse than a clumpy drink. Some users get around this by making their beverage in a blender, which prohibits them from using the product on the go, while many others use a shaker bottle to help mix up the powder. While ready-to-drink protein drinks may appear to be a solution, many consumers prefer to stick to the powder product for taste reasons. The ready-to-drink needs to be kept cold, whereas BlenderPak can be freshly mixed with cold water. 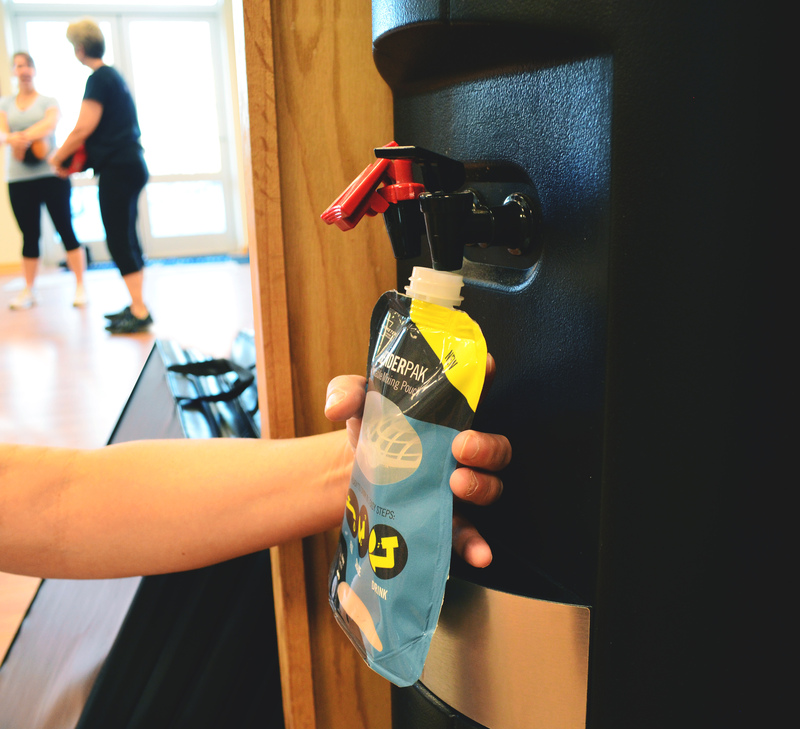 Consumers said they liked BlenderPak because it wouldn’t spoil and could be easily stored in places like the car, gym bag, or the office unlike many ready-to-drink alternatives. The second pain deals with the shaker bottle. Some consumers use a traditional shaker bottle sold at most nutrition or vitamin stores. Many complained the bottle is difficult to wash and said they would use a disposable pouch away from home. 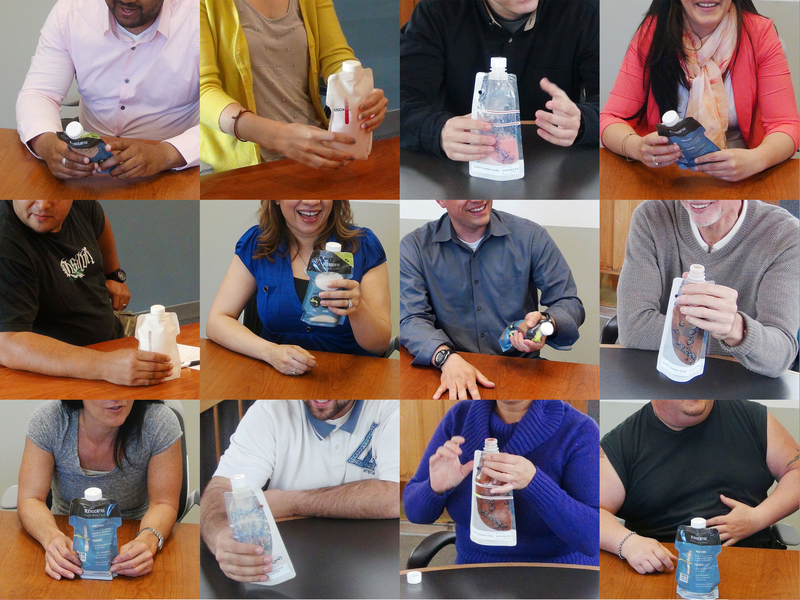 BlenderPak is a single-use no-cleanup solution and requires no extra cups, glasses, bottles, or spoons. We live in an on-the-go society, and a no-mess, no-cleanup solution appeals to many consumers who are active outside the home. Most powdered products are available in bulk-size canisters with the scoop is buried inside. The canisters are too large to use away from home, so many consumers resort to transporting portions of powder in a plastic bag or tupperware. BlenderPak is pre-filled with one serving of powder already inside, so there’s no scooping and no measuring needed. By talking to powder drink mix users about their on-the-go lifestyle we were able to discuss common problems, like clumpy and messy powder. We were also able to dive deeper into other problems, such as why ready-to-drink isn’t a suitable replacement, the freshness factor, and discovering the opportunities for new usage occasions at work and in the car. Ultimately, consumers told us that convenience is king. We look forward to consumer reactions to BlenderPak to see if, in fact, we’ve delivered a better way. For a long time, apples, oranges, and bananas have ruled the roost when it comes to fresh produce on-the-go. Most fruits and vegetables require cleaning, peeling, or need protection from squishing – hardly a grab-and-go ideal. For snack-pack sized packaging solutions, mini boxes of raisins or of syrupy cups of fruit salad have been the standard. While consumers have lots of healthy on-the-go options when it comes snacks like nuts, or pureed smoothie-like drinks full of fruits and vegetables, there haven’t been many offerings for snack-size servings of fresh produce. Recently we’ve noticed a number of brands coming out with individual portions of fruits and vegetables. With many dip brands (such as Sabra hummus and salsa, Jif peanut butter, and Wholly Guacamole dip) coming out in their own on-the-go cups, it seems natural that prepared fruits and veggies would follow. 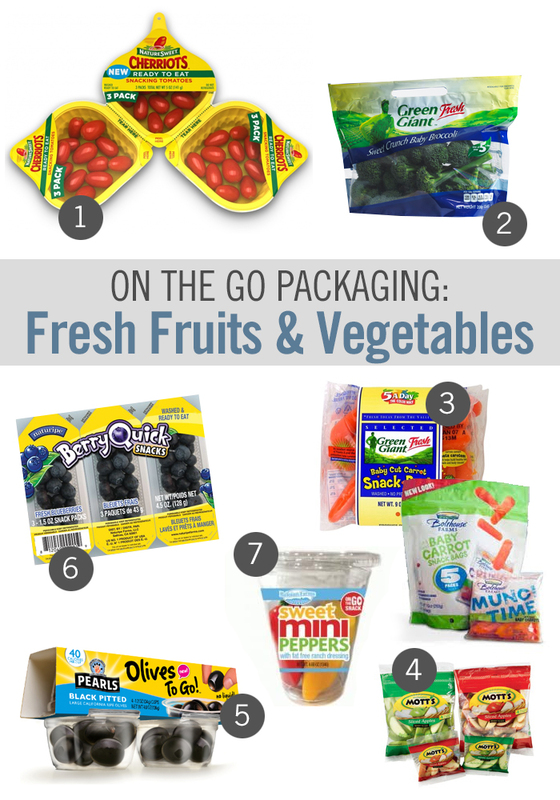 What’s the easiest way to take fresh fruits and vegetables on the go?